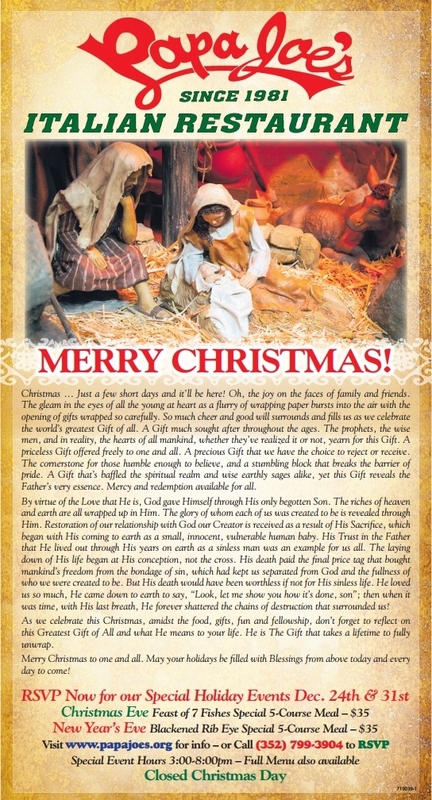 Christmas Eve & New Years Eve Event! As a Community, WE were able to make a difference in the lives of local Veterans that have served US and our country. 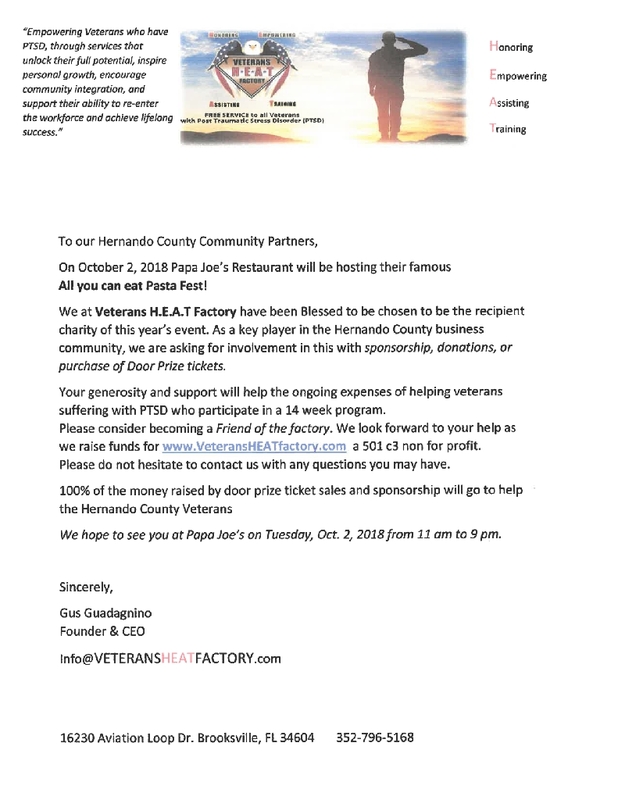 Through Papa Joe’s Annual Pasta Fest Fundraiser, we were able to raise about $8000 for Hernando County Veteran’s HEAT Factory. Special “Thank you’s to our sponsors: Coca-Cola, Edward & Don Company, PFG, Sysco, Walmart, Withlacoochee River Electric Company. Thanks to Grace Brethren Church, Hillside Baptist Church, and The ARC for their assistance in parking. Thank you to Spring Lake Methodist Church and Sunshine Tents for equipment and stage provisions and Grace World Out Reach Church for the use of their sound equipment, sound tech extraordinaire - Ken Crandall, and Pastor Mindy Kerr for MCing the event. Thank you to our volunteers from Nature Coast Key Club and Hernando High Culinary Club that helped make all the games and concessions possible. Thank you to all our entertainment volunteers for all their wonderful displays of talent. Special thanks to Vanessa Wong and her horses for filling in at the last minute with her greatly appreciated horseback rides. Thank you so much to Kathy Reitz for coordinating and Pat Herman for co-coordinating this event. You ladies are AMAZING! 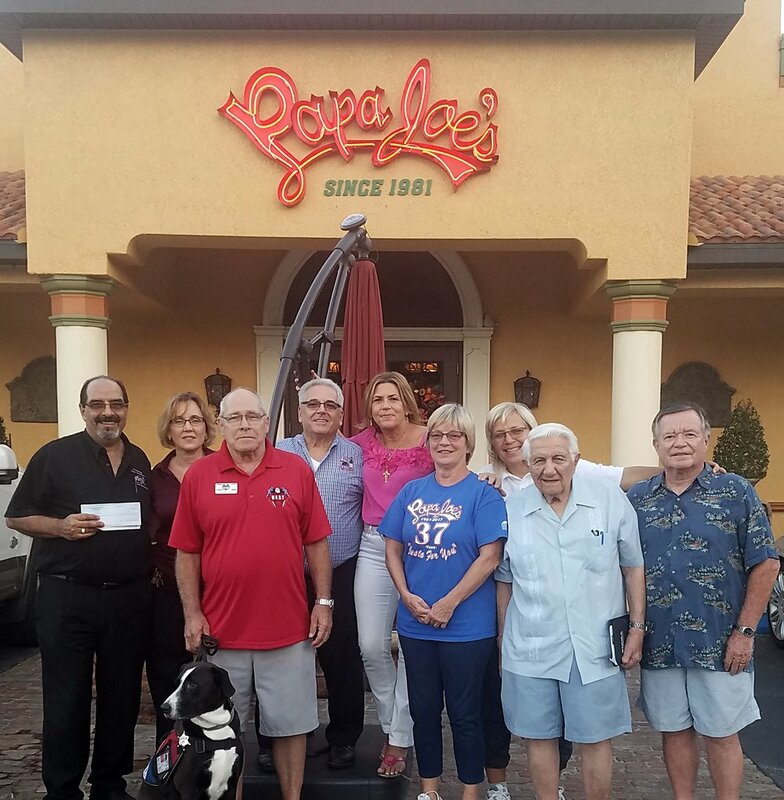 And of course our own Papa Joe’s staff, you ROCK!! Most of all Thank You to YOU, our wonderful community for showing up to make this event a success! People helping people is what community is all about!! 2018 Papa Joe's Pasta Fest! 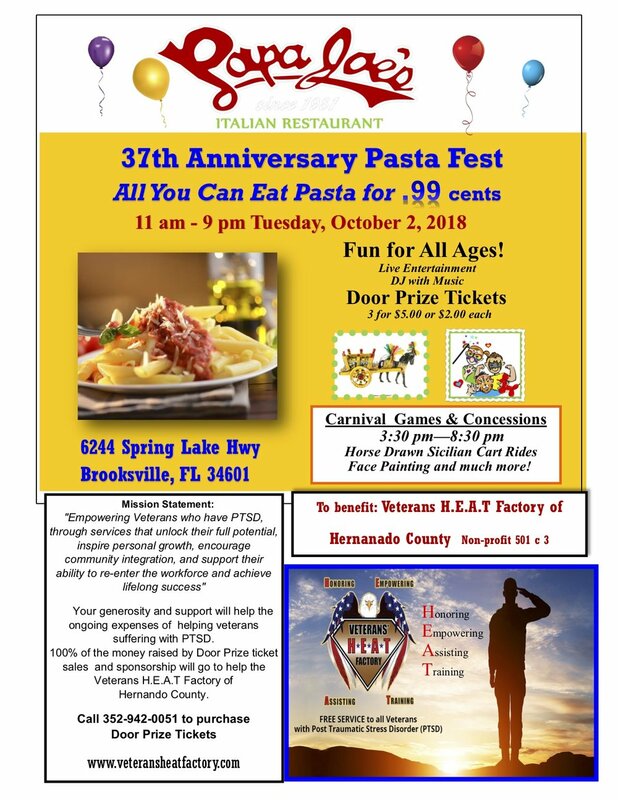 Join us for Papa Joe's 2018 Annual Pasta Fest ~ Help Support our Veterans! Coming Soon! Papa Joe's .99¢ All You Can Eat Pasta Fest!